Home Networking - Be-Com Computers 5774 Bradbury Road Nanaimo B.C. Wire you home’s many smart devices for convenience and entertainment. Home networking allows you connect all your devices to a single Internet connection and more. Computer networking allows you to browse the internet, stream music from one location to another and much more. Today’s networking choices are many – wireless, wired using ‘Cat 5’ cable, even using the building’s existing wiring. 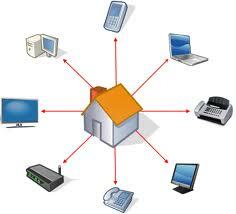 Let the experts at Be-Com Computers take all the mystery our of a home network. Call our local or free numbers to talk FREE to a friendly tech about your project. We’ll fill you in on your options and help you with your next steps.